The chassis probably isn't going to be the most expensive part of your next self-build project, but if you're working toward a tight budget, it can be oh so easy to fork out more than anticipated on an elaborate enclosure. You could argue that a good chassis will last well beyond subsequent builds, but let's face it, for most users, these are simply boxes that are rarely opened, kept under the desk, and tasked with two things; pull cool air in, chuck warm air out. 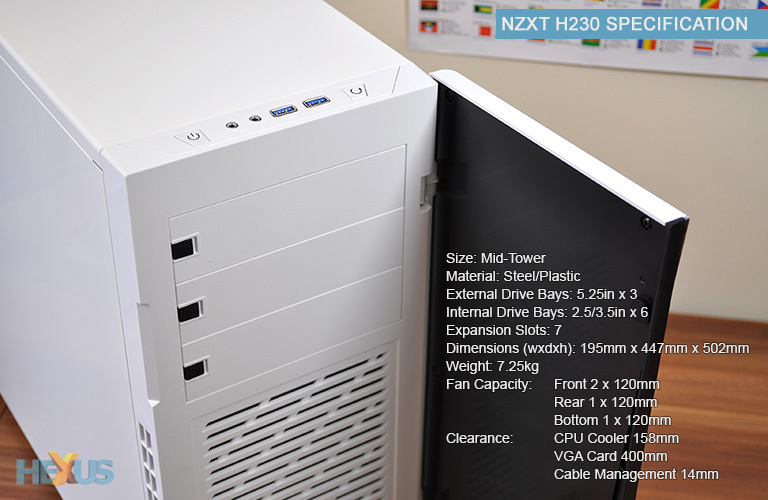 If that's your line of thinking, and you want to keep chassis cost down to a reasonable level, take a look at NZXT's H230. 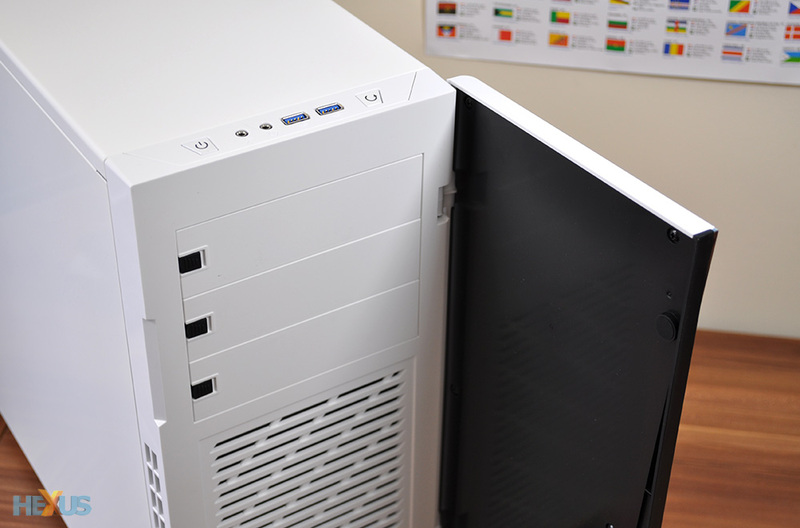 Priced at just under £60 and available in black or white, this mid-tower solution is described by NZXT as "the perfect silent chassis for users looking for the bare essentials." Silent may be a slight exaggeration, but for those who prefer a quieter computing experience, it's worth noting that the H230 comes equipped with sound-absorbing padding on its side panels in an effort to dampen noise output. Keeping true to the bare-essentials philosophy, however, the padding doesn't extend any further - there's nothing lining the front or top, so the H230 isn't attempting to go toe-to-toe with premium sound-proofed solutions. 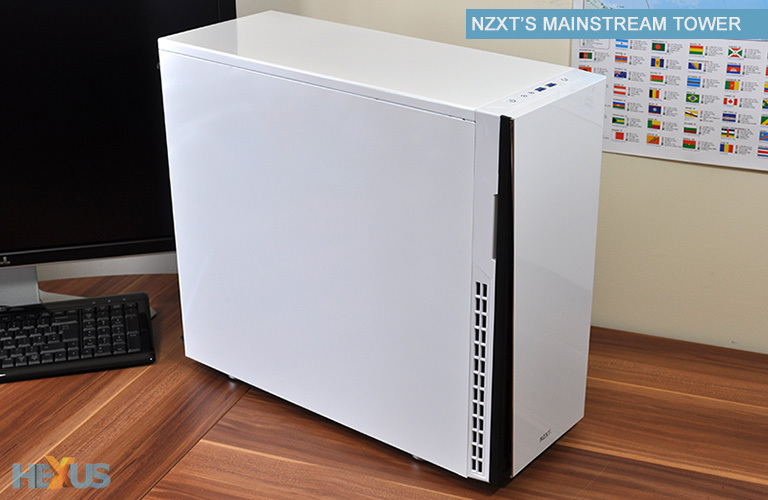 Readers who are familiar with NZXT's efforts will know that the company has a taste for the ostentatious, and though the H230 is one of the firm's more subtle efforts, it still catches the eye. The steel frame is adorned with an angular plastic front fascia that's extremely glossy, and while there are no flashy LEDs, the all-white chassis is still likely to turn heads. Those hoping for something a little more subtle would be better served by the black variant, though if it's possible, that model appears glossier still. Chassis design, as always, is a personal preference, but the key element here is that the H230 is pretty well-built for a sub-£60 enclosure. The steel frame feels suitably rigid, with no obvious squeaks or rattles, and the paintwork is both neat and close to a true, sparkling white. Our only reservation is that it is only paint, and it isn't a particularly thick layer, leaving it susceptible to visible scratches - our side panels are already showing scrapes along the edges. Reading NZXT's specification sheet suggests that you're getting a fair amount of chassis for your money. The 195mm (W) x 447mm (D) x 502mm (H) frame weighs 7.25kg and offers support for ATX, Micro-ATX or Mini-ITX motherboards, along with seven expansion slots, six hard-disk bays and four 120mm fan-mount locations. The no-frills front I/O panel is easily accessible and features dual SuperSpeed USB 3.0 ports, alongside a pair of audio jacks and backlit power and reset buttons. Helping maintain a clean look, the trio of external 5.25in bays are hidden behind a plastic front door. The overall look works well, but the magnetic door does have limitations - it will only open from left to right, and the hinge won't allow it to extend much past 90º. 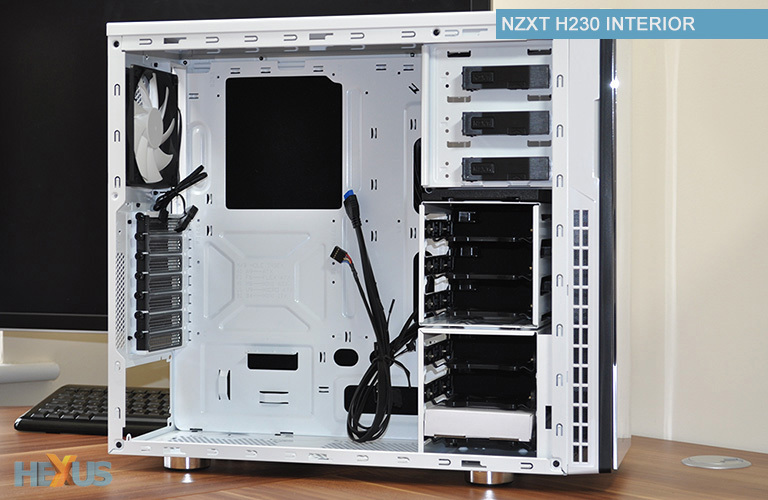 Step inside and the H230 feels reasonably spacious and well-laid out with a selection of user-friendly features. These include tool-free optical drives, modular storage bays, a large cutout in the motherboard tray, a bottom-mounted PSU bay, and a couple of rubber-grommeted cable-routing holes. That's almost everything a modern-day chassis should have, and though liquid-cooling opportunities are limited, there ought to be ample airflow for most builds. Four 120mm fan mounts are available - two up front, one at the bottom, one at the rear - and NZXT ships the H230 with a single front intake allied to the conventional rear exhaust. Adding a second front intake is easily done - simply pull away the chassis' plastic front - but the bottom mount is a little more fiddly and would be best used in conjunction with a short PSU. 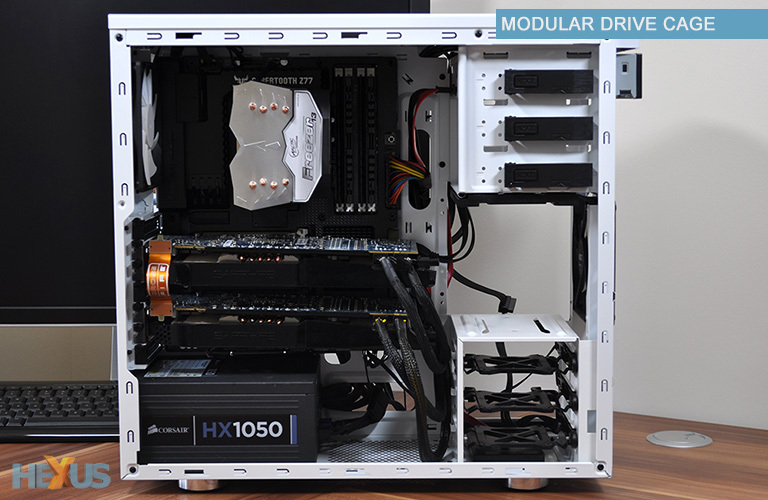 You won't find a fan controller, hot-swappable drive bays or anything particularly elaborate, but the H230's one clever trick - a modular drive cage - works quite well. The six storage bays are spread across two cages, and the upper cage can be removed entirely, leaving an open path for front-to-back airflow. Our high-end Intel Ivy Bridge test platform is armed with dual Radeon HD 7950 graphics cards and a high-power Corsair HX1050 PSU. To our surprise, the H230 accommodates this sort of high-end hardware without kicking up a fuss. We didn't experience any major issues during the build process, though, as you'd expect from a sub-£60 case, there are a few weaknesses. The motherboard standoffs, for example, aren't pre-installed, and the 2.5/3.5in drive trays have to be among the poorest we've seen. They're incredibly flimsy - to the extent that they fall out when carrying the chassis one from location to another - and, well, it's about time NZXT adopted a new tray design. Fortunately, for the SSD users out there, there is a dedicated 2.5in mount hidden at the base of the storage column, and it's a good way of avoiding the plastic trays entirely. These are minor niggles that detract from the build process, and we'd have to add the side panels to our list of grumbles, too. 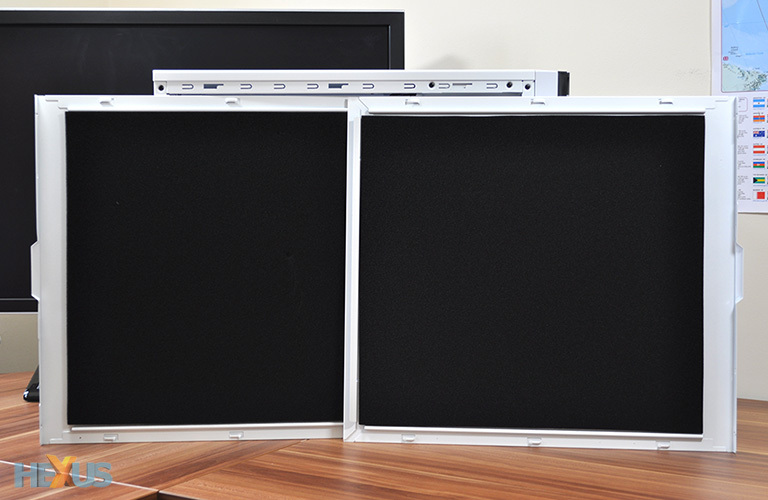 We appreciate the fact that both panels are lined with sound-absorbing material, however the notched design can make it tricky to get the panels fixed in place. 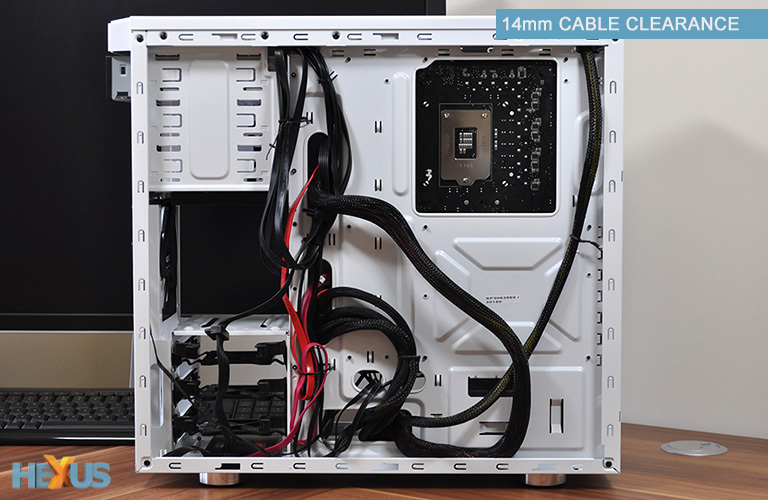 This isn't much of an issue on the component side, but around back, where excess cables are crammed into the 14mm gap, getting the side panel on can be infuriating at times. There's room for improvement, but on the whole NZXT has managed to meet most of our expectations for a sub-£60 chassis. Trouble is, there's no shortage of competition in this area of the market - Corsair's popular Carbide Series 300R is available for around the same price, and if it's quiet you're after, the £80 Fractal Design Define R4 may also be within reach. 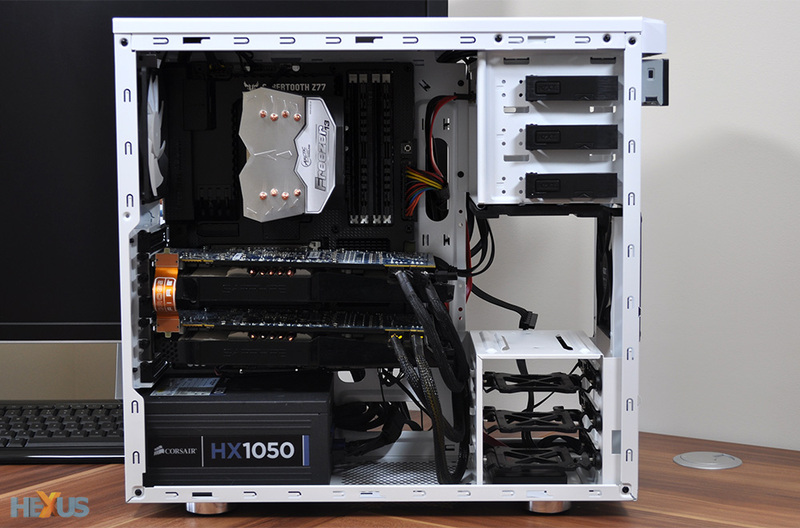 The questions now are whether or not the sound-proofing makes a meaningful difference, and is there really enough airflow for the H230 to cool our high-end components?